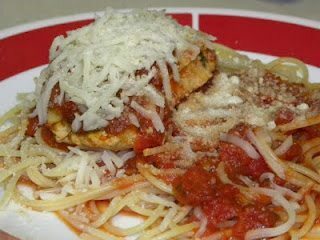 Spaghetti is a very economical meal, but I am always looking for ways to make it unique and change it up a bit. These Slow cooker Pizza Pork Chops are kid friendly and delicious! Try them this week instead of boring ole’ spaghetti. Place oil in Large skillet over medium heat. Sprinkle Pork chops with salt and pepper and cook for about 4 minutes on each side. Place pork in 3 1/2- to 4-quart slow cooker. Sprinkle onion and garlic over pork. Add pasta sauce. *Suggestion* Put things you like on your pizza in the crock pot with the pork. I bet things like mushrooms, bell pepper, or red pepper would be delicious. I served these with regular pasta, because I haven’t been to the store yet this week to get the orzo. You could serve these with any type of pasta and they would be so yummy! **Mix Ins** You can add your favorite pizza toppings as mix ins (pepperoni, mushrooms, peppers etc) **Gluten free** Just use your favorite gluten free pasta and read the labels of your other ingredients to ensure they are gluten free!